Intel's brand new Haswell processors (also known as fourth generation Core processors) bring little to the table for desktop PCs, but include a number of improvements for mobile devices. To coincide with Intel's new chips, Sony has launched a refreshed lineup of Vaio Ultrabooks, which the Sony Vaio Duo 13 is part of. It's the immediate successor to the Sony Vaio Duo 11, a decent attempt to bring the power and comfort (especially when typing and working) of and Ultrabook with the simplicity and convenience of a tablet device, that had a few too many compromises and failed to capture the imagination of potential purchasers. So how much of an improvement over the Sony Vaio Duo 11 is the Sony Vaio Duo 13, and how does it compete with other convertible laptop-tablet hybrids such as the Dell XPS 10 or the Acer Aspire R7? It's clear that Sony has taken onboard a lot of the criticisms levelled at the Vaio Duo 11, from major concerns such as a poor battery life that could only be boosted by an expensive and bulky add-on, to smaller criticisms of a lack of a place to stash your stylus when not in use. Yet there are still a number of challenges that remain the same from when the Duo 11 launched, which means the Duo 13 has its work cut out. The first challenge faced by the Sony Duo 13 - along with its hybrid competitors - are criticisms of being jacks of all trades, masters of none. While hybrids are supposed to contain the best features of laptops, Ultrabooks and tablets, they often bring the downsides of each platform as well - and these downsides can often be more apparent than the benefits. This means you get a tablet-like device that's hobbled with the low battery life of a laptop and the high price tag of an Ultrabook, while having a laptop-like device with the small and often poor screen of a tablet. Has Sony managed with the Vaio Duo 13 to make a device that genuinely transcends the faults of its competitors, and made a hybrid whose whole is greater than the sum of its parts? The second problem the Sony Vaio Duo 13 faces is slightly more complicated: Windows 8. It's a perfectly fine operating system that remains pretty much unloved. Has Sony got what it takes to finally make an allusive must-have Windows 8 device? There are a number of improvements to the body and under the hood between the Sony Vaio Duo 13 and the Sony Vaio Duo 11. The most visible difference is the screen, which has been increased from 11 inches to 13.3 inches. As with the Sony Duo 11, the screen looks fantastic, benefitting from a Full HD 1080p resolution that makes Windows 8 look fantastic. The bigger screen means that the desktop side of Windows 8 is a bit easier to use, especially when using the touchscreen on non-touchscreen optimised windows and menus. Within the tiled Windows 8 user interface the touchscreen works well. The increase in screen real estate inevitably means that the Sony Duo 13 is larger than the Sony Duo 11, with dimensions of 19.5 x 210 x 330mm (0.77 x 8.27 x 12.99 inches). With a few features shifted about it means that although the screen is a fair amount larger, the whole size of the Sony Vaio Duo 13 isn't too much bigger than the Sony Vaio Duo 11. It only weights slightly more than the Duo 11, at 1.3kg (2.93lbs), which is still perfectly comfortable to hold. Another headline improvement is that battery life has been increased from the Duo 11's rather paltry four hours to a potential 10 hours. A large part of this increase in battery life is thanks to Intel's new Haswell processor, which is far more power-efficient. With the Sony Duo 11 you could buy a separate battery pack that would almost double the battery life, but would also make the laptop much heavier and more cumbersome. With this in mind, the doubling of potential battery life with just a small increase to the overall weight of the Sony Duo 13 is definitely impressive. We say potential battery life, because when these numbers are quoted in press releases they often refer to when the machine is turned on, but barely being used. Our more rigorous battery tests in a minute will see how much battery life we can expect when using the Sony Vaio Duo 13 in more realistic scenarios. 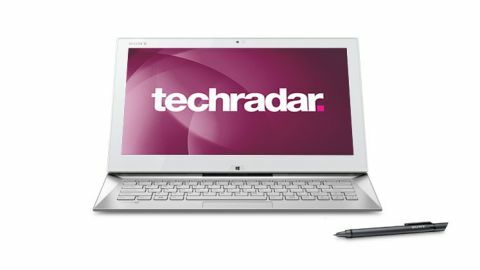 The main driving force behind this hardware refresh is the fourth generation Haswell processor, with the Sony Vaio Duo 13 that we tested containing a Core i7-4500U clocked at 1.80GHz, with a turbo boost of 2.39GHz. As with the Duo 11 you can choose from a selection of processors in Core i7 and i5 variants, depending on your budget. With the fourth generation processor comes an increased integrated graphics chip in the form of the Intel HD Graphics 4400. Depending on the type of processor you choose with the Sony Vaio Duo 13 you could also get the Intel Iris graphics 5100, but that comes with a high price premium. Elsewhere the Sony Vaio Duo 13 comes with a Full HD web camera, using Exmor RS technology, built-in Wireless N, Bluetooth, an MS/SD card reader, two USB 3.0 ports, headphone and microphone jacks and an HDMI out port. The Sony Duo 13 drops the VGA port of the Sony Duo 11, but comes with an HDMI to VGA adaptor, and also sacrifices the Ethernet port, though a handy Ethernet to Wi-Fi adaptor is also included. Like all new Vaio computers, the Sony Vaio Duo 13 comes with a built-in NFC (Near Field Communication) chip, which makes importing photos from compatible devices a cinch. We paired it up with an NFC-enabled phone (also made by Sony) and it worked a charm. So do the improvements in specifications translate to an increase in performance? From the off (in more ways than one) the Sony Duo 13 takes a superb tablet innovation and applies it to the hybrid form factor - almost instant on. From hibernation the Sony Vaio Duo 13 wakes up and loads Windows 8 in a matter of seconds. This speedy wakeup can be attributed to both Windows 8 and Intel's new processor, but it's still impressive and implemented well by Sony. Even when booting from cold, Windows 8 only takes around eight seconds to load up. The increased screen size is nice for media, with colours and contrast in particular looking brilliant, thanks to Sony's clear experience in visual technology (such as Triluminos, which can be found in Sony's Bravia TVs such as the Sony KDL-55W905A as well). The size of the Sony Vaio Duo 13 also, however, makes it far less portable than its tablet competitors. The unique sliding method of going between tablet and Ultrabook modes (known as Surf Slider design) has been improved and is much easier than with the Sony Duo 11, and can even be done one-handed. The feel of the joins is also much more sturdy. When in Ultrabook mode, the keyboard takes advantage of the larger body, with a comfortably sized keyboard that is nice and responsive. Another good sign is that the fiddly track button of the Sony Duo 11 has been ditched in favour of a proper trackpad, which makes using the Sony Vaio Duo 13 far easier. However, when in Ultrabook mode, the screen feels like it tilts slightly too far back for comfort, and there's no easy way to adjust this. The longer battery life has been much vaunted, and is certainly an improvement. With a full high definition movie playing on a loop, along with Battery Eater '05 benchmark in reading mode, we saw the battery drain in four hours and 47 minutes. This is of course a far cry from the 10 hours advertised, but still pretty good considering the stress the benchmark puts the Sony Duo 13 through. With lighter use, you should see battery lasting closer to a full day's use. Thanks to the new processor, plenty of RAM (in the model we tested it was 4GB or DDR3) and a solid state drive, Windows 8 and its various apps ran smoothly and quickly, with barely a pause or hiccup. It's a shame Sony has seen fit, as many OEM manufacturers do, to fill the Sony Vaio Duo 13 with so much unnecessary software. However, for work purposes you'll find the Sony Vaio Duo 13 solid, fast and dependable. So how much of a success - or failure - is the Sony Vaio Duo 13? Seeing as the Sony Vaio Duo 11 was a fair attempt at a hybrid machine and that the Sony Vaio Duo 13 brings improvements in nearly every aspect, we can confidently rule out it being a failure. Sony has made no bones about the fact that it wants people to see the new Vaio range - Duo 13 included - as premium products, and it shows. From the slim line and attractive design to the top-notch components included, this looks every inch the expensive product. Which is just as well, as with a full retail price of around £1,430 / US1,520 / AU$1,700 this is going to be a big hit on your wallet. We really liked the improvements to the sliding design, which makes it much easier to open and close. The addition of the new Intel processor means that overall performance has gone up a notch - though not quite as much as we'd hoped - but start up times and battery life improvements are all appreciated. The screen looks fantastic, and the increased size makes it great for media viewing, and the included digital stylus is a nice addition. The HDMI to VGA and Ethernet to Wi-Fi adaptors are both excellent alternatives to having the body enlarged to accommodate a VGA and Ethernet port, and it's great that they are included in the box. There's no getting away from the fact that this is an expensive product, and for the same price Sony is asking for you could get a Samsung Series 5 Ultra Touch Ultrabook and a separate iPad mini. While the sliding design has improved, it still feels a tiny bit delicate around the hinges, which isn't great for such an expensive product. When in Ultrabook mode the screen leans back a tad too far as well. Having the hard drive filled with bloatware is also an avoidable annoyance in our book. The Sony Vaio Duo 13 is an excellent product, and probably the best hybrid Ultrabook/tablet device we've seen, but with such a hefty price tag it's still not enough to convince us to ditch our separate laptops and tablets. It's a shame, because for £500 less we wouldn't hesitate to recommend the Sony Vaio Duo 13 that ticks most of the boxes and improves on a lot of its predecessors faults. However, for £1,430 / US1,520 / AU$1,700 or more, we'd only recommend this to business commuters with very deep pockets.